A week and a half ago I finished reading Alice Munro’s short story “Vandals” while riding the subway. The story, true to her form, begins in one place and follows one character and ends in an entirely different place, slowly unfolding a secret tragedy that leaves you feeling like you’ve been socked in the gut–her work affects me on a truly visceral level. When I put her collection of stories away and pulled out my phone, I found my Twitter feed bursting with news that she had won the Nobel Prize for Literature. My eyes welled with tears and I immediately sent a text to my friend and fellow Munro lover to celebrate the good news. Why is it so important that Munro won? Because out of 110 winners of this prestigious prize, only 13 have been women. No award for Virginia Woolf. No award for Edith Wharton. No award for Iris Murdoch. No award for E. Annie Proulx. And on and on. I’ve voiced my complaints before about the disparity between male and female literature writers and the problem with women’s books being treated as fluff, unimportant chick lit about domestic problems while men’s books are the real literature worthy of all the prizes. This is partly why I am so excited Munro won. The odds were in favor of Haruki Murakami, a novelist of epic imagination. Don’t get me wrong, I enjoy Murakami and his strange tales, but Munro beating him feels like a win on two accounts: a win for women and a win for the short story writer. No longer will I feel like I have to explain myself for writing mostly short stories, nor should I feel like writing about small towns and domestic dramas aren’t important enough subjects. Thank you Alice, or as the Nobel Committee called her, “the master of the contemporary short story,” for the validation. The good news continued with the announcement that New Zealand writer Eleanor Catton won the Booker Prize for her second novel The Luminaries. Catton set two records by winning for the longest book (over 800 pages) and for being the youngest winner at only 28. 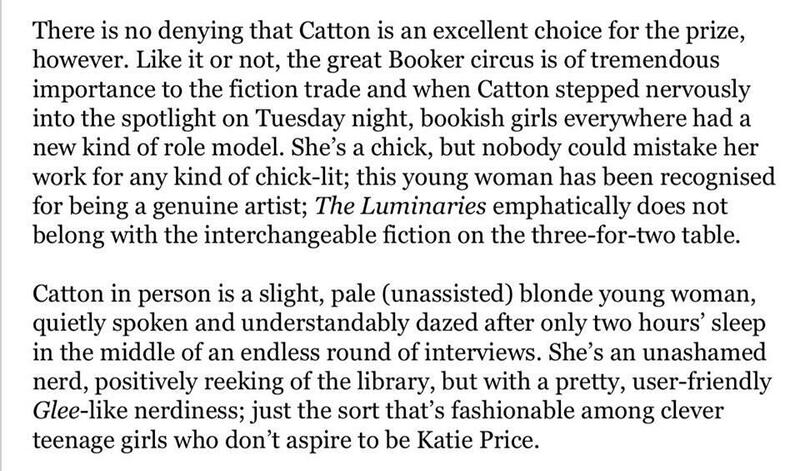 But for all her achievement, The Times of London chose to write in a post-award announcement piece about Catton’s appearance (“blonde” and “pretty”) and about how “she’s a chick; but nobody could mistake her work for any kind of chick-lit.” Really? We can’t celebrate her monumental accomplishment without resorting to discussing the way she looks and dropping the awful term “chick lit” into the piece? Can a woman writer be talked about without determining whether or not she writes chick lit? Can’t she simply be a writer, an intelligent, imaginative, and precocious writer who has accomplished something few people–young or old, men or women–have? Excerpt from The Times of London profile of Eleanor Catton. So I’m exhilarated that Munro and Catton have been recognized for their work. I hope someday women writers will be honored as often as their male counterparts. I hope someday when women win prestigious awards, commenters won’t attribute it to not writing chick lit. I hope they will acknowledge it for what it is–good writing.